I borrowed this board book from the library and loved it so much, I ordered a copy. Love how the moon, stars and fireflies almost glows in semi darkness and the poetry of sleepy animals falling asleep in reeds, weeds, waves and caves. Hoping baby grows to love this as a bedtime story too. Trying to check out some new children's books for Christmas gifts and as possible resources in my English classes. This one is a definite plus for gift-giving. Such a sweet little night-time read. Wonderful rhyming and delightful art! It's cute and has nice pictures, but it doesn't name the animals! Everyone is just "sleepy head." and it's really easy to modify to say the animal names, like instead of "another sleepyhead" you can say "an otter sleepyhead" or "a squirrel sleepyhead" and it works fine, so I don't know why the author was so lazy. I'm trying to read to my baby boy before he's born and while doing so, find the books I really like that I want to add to my registry and eventually his little library! This one definitely made the cut! It was an adorable book about sleeping animals and another sleepyhead that's missing from his bed. It was really sweet with beautiful illustrations. This is a great read outloud for any sleepyhead! Another adorable bedtime baby book. This is one of the most adorable toddler books I have ever read. My 2 year old boy loves it and wants to read it daily. Adorable bedtime book! I wish I could let my sweet baby sleep in my arms all night long. Sweet illustrations help teach wee ones about animals and where they sleep written in rhyme with a precious surprise ending. Great for a bedtime story. A sweet book to help coax a sleepy one to bed while learning about nature and animal sleeping spots. Here in the Northern Hemisphere, the sun sets quite late in the summer. I relied on room-darkening blinds and soft music to lull my toddlers to sleep when the sun was still shining. 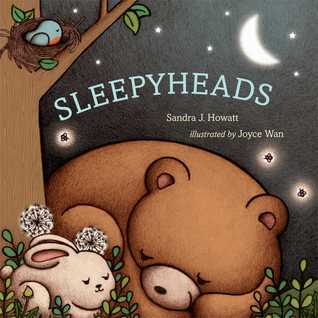 If only I had owned a copy of Sandra Howatt’s delightful, yawn-inducing Sleepyheads about a decade ago!Howatt’s story begins outdoors under soft moonlight with a delightful assortment of cuddly creatures snoozing in nests, trees, caves and waves. The cozy dozers – bear, duck, rabbit, pig – are relaxed and content. Quiet oozes throughout the soft “S” assonance sprinkled through the rhyming lines. While an owl keeps vigil (This one’s not a sleepyhead – this one slept all day!) we transition inside the house where the cat and dog are sound asleep. There is one last special sleepyhead to be found, where a pillow, bed and blanket await.Wan’s illustrations are perfectly sweet, soft and soothing. Fuzzy, thick-edged images reinforce the look of deep night sky, with subtle pops of pink, green and brown. The creatures are rounded into large, simple shapes that are just right for little ones learning animal names and homes. The night sky is sprinkled with luminous, glowing stars as tiny fireflies dot pages in a lovely rhythm.Sleepyheads is just long enough, just soft enough, and just dreamy enough to cause even the most sleep-resistant tots to rub their eyes. Kirkus gave Sleepyheads a starred review, calling it “A superb execution of soporific shapes and sounds perfect for the bedside table.” Perfect for sweet nighttime tuck-ins! This book is a good concept book for children. It teaches children that when it gets dark and the moon comes out (when nighttime comes), it is time to go to bed. Not only does it teach children that rest and sleep is important, but it also teaches children about animals and their natural environments. It shows that birds sleep in nests, bears sleep in caves, etc. The illustrations help children understand so easily, it is great! Head out on a journey in the night to find out where different creatures are sleeping. Each one is tucked into the space they like best at bedtime. There is the bear in his cave, the otter rocking back in the water, the pig in the hay, and many more. Then the owl is on the page, not sleepy at all. The book then turns to the house and the pets sleeping, but the little human bed is empty! Where can that last little sleepyhead be? Safe asleep in Mama’s arms. Simple and beautiful, this book has a gentle rhyme that soothes also with a rhythm that is like rocking to sleep. Young listeners will get to identify the different animals as the pages turn, since the book leaves that up to the reader. The quiet mystery of where the last sleepyhead is found is a wonderful little twist at the end, just right as children snuggle down to their own beds.Wan’s art is dark and beautiful. The night is lit with fireflies and the moon, the darkness deep and velvety but not frightening at all. As the reader visits each dark page, there is always a source of light beyond that in the sky so that the characters themselves shine on the page. A wonderful bedtime read, this one shines with moonlight and dreams. Appropriate for ages 1-3. This is one of those soft, sweet books that you can enjoy while having a snuggle/reading time (especially if it is just before bedtime or naptime). With rhyming text and a calming rhythm readers find out where all sorts of little ones “lay their sleepy heads.” Such as bears, otters, or puppy dogs. But where is the missing sleepyhead that is missing from the bed with the teddy bear? Potentially where the young readers will be as well–“Asleep in Mama’s arms!”Even though the text and the rhymes are great, the illustrations are as sweet and calming as a warm blanket. The colors on the animals aren’t just one solid color. For example the white bunny has dark brown/black bits shaded in to show which part of the bunny is in shadows and to help enforce the idea of it being nighttime. Also, there are dark lines going out from the moon to help show the light halo that is around light sources at night. Plus all the little animals just look hugable and like something that little ones would love to look at and cuddle. I seriously need to add this to my bedtime story time. Such fun. This board book version of a previously released picture book features soothing, repetitive text and muted soft illustrations of sleeping animals. In rhyme, the reader is urged to, “See the moon? It’s sleepy time. / Let’s look for little beds / and find where all the little ones / lay their sleepy heads.” The animals (bear, otter, duck, rabbit) are all called “sleepyheads” which gives readers the chance to name what each one is. Near the end, in a bedroom in the house, “I see a blanket, soft and warm. / But where’s the sleepyhead?” allows young readers to chip in with the answer as the missing “sleepyhead” is located on the last page. It’s a baby, “Asleep in Mama’s arms!” What an ideal way to help little ones feel safe, loved, and best of all, drowsy! A book to charm the child to sleep. It is for the very young...just old enough to understand a short, simple story. The child sees other animals who know it is time for them to go to sleep, so they, too, can rest well with the other animals of the world. Of course, there is the owl that stays up at time. We see the animals in all different kinds of places to sleep, also. Giving the child a little better understanding of the creatures of the world, that they too sleep, and where they might do so. Sleepytime has come! Sleepyheads visits babies of all kinds in nature, to see the safe places which each calls home. The simple rhyming text makes it a good choice for storytimes with early literacy participants, and the lush illustrations are lovely. Sleepyheads by Sandra J. Howatt, illustrated by Joyce Wan. Published 2014 by Beach Lane Books, an imprint of Simon and Schuster Children's Publishing Division. Review crossposted to my blog, Life in the 025.5, as part of an article on books for Pyjama Storytimes. This one is a cute picture book about where all the different animals are sleeping, but one little sleepyhead is missing.What a CUTE book! We loved it. The pictures are adorable and sweet, they just made me smile. Simple, cute rhyming sentences. Visits lots of sleeping animals outside, and then some inside until you find where that missing sleepyhead is sleeping.My daughter wanted to read this one over and over. We usually only get books from the library, but this is one that I think is worth buying. Moonlight drenched animals against a night sky, help to create a restful rhyme that has just enough suspense to keep the reader turning the pages. VIEWS2 / Supercharged Storytime skillsPhonological Awareness-rhyming textVocabulary-animal are show but not named. Reader can ask children to name animals pictured.Dialogic reading-each page is illustrated with plants and creatures not named in the text. Ask children to name things they see on the page.